Summary and Definition: The Mandan tribe of North Dakota, "the tattooed people", were traditionally hunters, traders and farmers who lived in fortified villages of earth lodges on the Great Plains. The name of the most famous chiefs of the Mandan tribe included Abdih-Hiddisch, which translates as "Road-Maker" and Mah-to-teh-pa, or Chief Four Bears and Chief Shahaka (Big White). 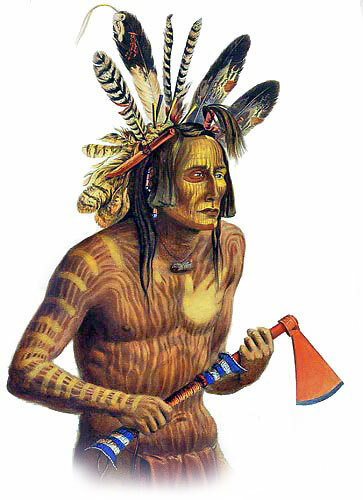 The Mandan tribe - The "Tattooed People"
The Mandan tribe were known as "the tattooed people". 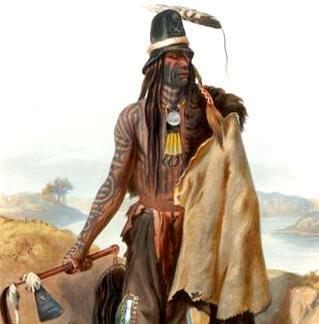 The above picture by by Karl Bodmer (1809-1893) clearly depicts tattoos on the chest, right arm and hand of the Mandan Native Indian together with additional tattoos on his neck and face. In Mandan mythology the Creator god, Tirawa, was believed to have taught the Mandan people the art of tattooing. Native American Indian tattoos were highly symbolic marking an important event in a person's progress in life and often accompanied by sacred ceremonies. The Mandan tribe used a variety of dyes and pigments for tattoos. What was the lifestyle and culture of the Mandan tribe? Most of the Plains tribes gave up permanent villages after they got horses, but this was not the case of the Mandan tribe. The Mandan tribe were semi-nomadic tribe of hunters and farmers. The Mandan cultivated their lands and raised crops of corn, beans, sunflowers, squashes, and pumpkins. The Mandan tribe famous from the tattooing on face and body. The system of using sign language was developed to facilitate communication between all of the different tribes who inhabited the Great Plains and to facilitate trade with the white trappers and traders. The Mandan were described in the Native Indian sign language as "the tattooed people." 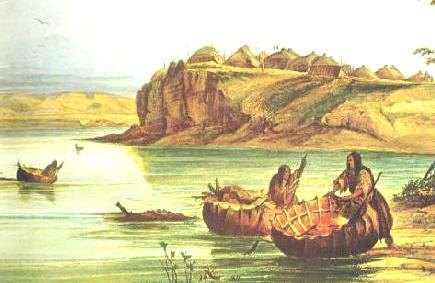 The Mandan tribe lived in permanent villages of earthlodges near the Missouri River. Their fortified villages were surrounded by palisades and became commercial trading centers during the fur trade of the 18th and 19th centuries. The Mandan became closely associated with the Arikara and the Hidatsa who collectively became known as the 'Three Tribes'. Where did the Mandan tribe live? The Mandan are people of the Great Plains Native American cultural group. The location of their tribal homelands are shown on the map. The geography of the region in which they lived dictated the lifestyle and culture of the Mandan tribe. What did the Mandan tribe live in? The Mandan tribe lived in Earthen houses, also called earth lodges, which was a type of permanent home for Native Indians who lived in harsh climates without large forests. The Mandan also used tepees as a form of temporary shelter when they went on buffalo hunts. Earth lodges were semi-subterranean dwellings which were dug from the earth, with a wooden, domed mound built over the top that was covered with earth or reeds. The Mandan built their earth lodges near their fields, usually on bluffs overlooking the Missouri River. 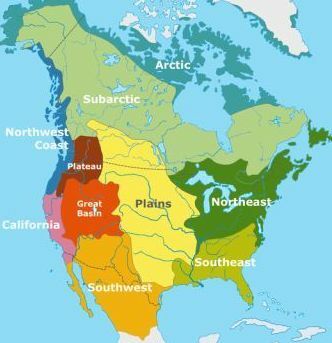 Among the early Plains tribes that also lived in earth lodges were the Arikara, Hidatsa, Pawnee, Omaha and the Osage. What type of transport did the Mandan Tribe use? The main type of transport for the Mandan tribe was the horse. However, the village tribes like the Mandan who lived along the Missouri River also used a small, bowl-shaped bullboat. They made the bullboat by stretching a buffalo hide over a wooden frame. It was too clumsy for water travel, but it could be used to ferry people and products across the river and for fishing. The above picture by Karl Bodmer was painted c1832 and shows a Mandan village and bullboat. What clothes did the Mandan men wear? The clothes worn by the Mandan men consisted of breechcloths, fringed buckskin tunics and leggings. Warm buffalo robes or cloaks or blankets were also worn to protect against the rain and the cold. The Mandan men wore beaded, straight-up feathered bonnets in a halo style decorated with eagle feathers and beadwork as a symbol of courage and accomplishments. They wore moccasins, a soft, light beige, slip-on shoe, consisting of a sole and sides made of one piece of leather. The women of the Mandan tribe were responsible for making the clothes worn by the people. Most garments were sewn from the soft, tanned skins of deer (buckskin) and buffalo hide. Mandan clothing was often decorated with paint, porcupine quills or beadwork. Mandan clothing for both men and women were adorned with ornaments, especially necklaces and earrings. What clothes did the Mandan women wear? The type of clothes worn by the Mandan women were knee-length dresses and leggings. The women also wore the buffalo robes to keep warm and dry. The dresses of the Mandan women that were used for special ceremonies were intricately decorated with beads. Dresses were also painted with symbols that reflected their tribal identity and family values celebrating acts of courage by their men or sacrifices made for the well-being of the family and tribe. Mandan women wore their hair long worn in two, thick braids that were often decorated with beads. What language did the Mandan tribe speak? The Mandan tribe spoke in the Caddoan language. The Mandan used picture writing to record their history. Winter counts were pictorial calendars or histories in which tribal records and events were recorded in picture writing The Winter counts named each year by an outstanding event. The famous Leonid meteor shower took place on the morning of November 13, 1833 that was witnessed throughout North America was recorded in a Mandan Winter count. What did the Mandan tribe eat? The food that the Mandan tribe ate included the crops they raised of corn, sunflower seeds, beans, pumpkins and squash. The food from their crops was supplemented by meat, especially bison, that was acquired on the hunting trips. The meats also included deer, elk, bear and wild turkey. Their main food were supplemented with roots and wild vegetables such as spinach, prairie turnips and potatoes together with berries and fruits such as melon. When food was scarce the Mandan tribe ate dried buffalo meat, called pemmican. What was the religion and beliefs of the Mandan tribe? The religion and beliefs of the Mandan tribe was based on Animism that encompassed the spiritual or religious idea that the universe and all natural objects animals, plants, trees, rivers, mountains rocks etc have souls or spirits. The Great Plains tribes such as the Mandan believed in Manitou, the Great Spirit. The rituals and ceremonies of the Mandan tribe and many other Great Plains Native Indians, included the Sweat Lodge ceremony, the Vision Quest and the Sun Dance Ceremony. During the infamous Sun Dance ceremony the young men of the Mandan tribe endured a a four day ordeal in which they were first cleansed in a sweat lodge, then undertook a long solitary experience exposed to the heat of the day and the cold of the night. They then entered a special lodge and had parts of their bodies slashed and were hung up by ropes attached to skewers in the shape of sharp animal claws, that were embedded in their flesh. The scars they bore served as a mark that they had undergone the Sun Dance ritual and had undertaken a difficult journey on their Vision Quest. The last Mandan Sun dance ceremony (Okipa) was performed in 1889. The Mandan tribe used the sacred, ceremonial pipe (called a Calumet), which was ritually filled with tobacco and passed among participants at all sacred ceremonies of the Mandan Tribe. What weapons did the Mandan use? The weapons used by the Mandan tribe included bows and arrows, stone ball clubs, hatchet axes, spears, lance and knives. Painted war shields were used on horseback as a means of defence. The Mandan tribe developed a ceremony to consecrate firearms. Many tribes attributed the outcome of battles to good or bad 'medicine, not the accuracy of the shooters. Who were the most famous leaders and chiefs of the Mandan tribe? The most famous leaders and chiefs of the Mandan tribe were Abdih-Hiddisch, (Chief Road-Maker) and Mah-to-teh-pa (Chief Four Bears), Chief Shahaka (Big White), Chief Red Cow and Chief Gray Eyes. The tribe were enemies of the Lakota Sioux and the Assiniboine tribes. Mandan History Timeline: What happened to the Mandan tribe? The following history timeline details facts, dates and famous landmarks and battles fought by the Mandan Nation. The timeline explains exactly what happened to the Mandan tribe. The Mandan have originally formed a single tribe with the Gros Ventre. For additional facts and information about legends refer to the Mandan Story of Four Bears.